Brine vinegar, water, sugar and salt to a boil in a 1-quart pot. Remove from heat. Add onion, set aside to cool. Add cooled onions and pickling liquid to a 16-ounce jar; refrigerate for up to 1 month. Note from Chanie - You can also use this brine over sliced cucumbers for instant pickles or other vegetables of your choice. 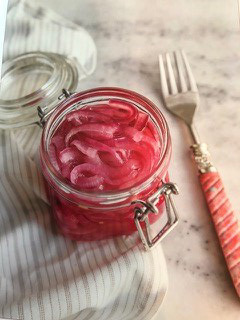 Pickled onions make a great addition to fish tacos, pulled beef sandwiches, hot dogs, grilled cheese, burgers and salads.